National Research and Education Networks (NRENs) are gaining clout in Africa. At the last count, UbuntuNet reports 13 NREN members and 6 NRENs in development in East and Southern Africa, while WACREN reports 2 NREN members and 9 NRENs in development. UbuntuNet and WACREN are regional RENs for their respective regions. This modest success has come with repeated failures, often after multiple attempts at forming an NREN within the same country. Many times, the failure has been the result of competition amongst member institutions or simply the perception that an NREN would favour a particular institution. The indifference of most national governments has also not helped. Despite the challenges, Africa now has some NRENs to talk about outside of South Africa’s TENET. Emerging NRENs like Kenya’s KENET or Tanzania’s TERNET are already peering with their global counterparts via the UbuntuNet hub in London. The successful efforts emanate from recognition by a few local research and educational institutions that they stand to benefit more from working together, despite their competition, rather than alone as has been the norm in different African countries. Luckily, early adopters tend to leave the door open for others to join when they come around, in true NREN-spirit. Emerging trends in Africa indicate that when Universities drive NREN formation without government intervention, the tendency is to work together to address a common problem—usually the high cost of bandwidth – by pooling resources like in the KENET example. Where governments intervene to start an NREN, they tend to provide basic infrastructure to interconnect members like in Sudan’s SUIN or even subsidise the cost of bandwidth like in Rwanda’s RwEdNet. As more African countries embrace ICT as a tool that can be leveraged to improve their education systems, a number of opportunities are available for NRENS. Perhaps the biggest role NRENs can play is the development of the necessary technical human expertise to help sustain this drive. Many African countries are working towards getting access to international fibre optic cables in an effort to improve Internet connectivity. With faster pipes to the Internet, also come digital espionage, hackers, malware and many of the other vices of the Internet realm. NRENs can become a valuable national asset that is independent and knowledgeable, helping nurture the requisite knowledge to not only appropriate the digital realm, but also secure networks in the national interest. Examples might include coordinating a national Computer Emergency Response Team (CERT), managing critical infrastructure like an Internet eXchange Point (IXP) or even the country code top-level domain (ccTLD) registry. Unfortunately, few if any African NRENs have so far gone down this route. An NREN can help address various ICT divides that exist within a country. An access-divide might exist between institutions with Internet connectivity and those without because they cannot afford or are simply out of reach. Through the NREN, well-off institutions or even government can help subsidise poor institutions in the national interest. A geographic-divide might exist between institutions near the capital city that pay much less for connectivity compared to their rural counterparts who pay much higher costs. Usually the NREN guarantees the same bandwidth cost irrespective of distance like the case of KENET in Kenya or TENET in South Africa. There are challenges that NRENs have to navigate before they can play a complementary role in the development of many African countries. Key amongst these is the lack of recognition by national governments of the critical role that NRENs could play in national development. Thus, many have neither created an enabling environment with supportive policies nor provided the necessary funding for NRENs to thrive. Many national regulators do not quite understand the operations of NRENs and have no distinct license that can permit their full range of activities. Hence an NREN has to engage and educate a whole range of players across different levels of government in order to be able to operate. There is also still a perception amongst some within the private sector, particularly the local telcos or Internet service providers (ISPs), that NRENs are their competition. This makes it harder to argue for special status or funding that is critical to get NRENs off the ground. Often, the commercial sector and indeed regulators argue that this special treatment might distort the local market. These private sector players are usually more effective lobbyists and can severely hamper a nascent NREN’s activities or even kill it off, in circumstances where NREN members have not convalesced around a common problem. Given that many emerging NRENs do not own infrastructure and have to rely on the private sector, they have to walk a delicate path in the beginning to survive and thrive. Sustainability of African NRENs is another significant challenge. Even in the rare case that capital costs are born by another party (government or development partner donation), recurrent costs tend to be a problem for most since network spares and maintenance are both costly. Good technical ICT expertise is difficult to nurture, but once developed, the NREN finds itself in competition with the private sector. NRENs have to devise different motivational schemes to hold onto exceptional talent since they cannot match private sector salaries. Sometimes being on the cutting-edge of network technology can attract talent, but one wonders if African NRENs could collaborate more to attract and retain talent. Information and management systems are still costly, but while becoming increasingly critical for member operations, this is an area worthy of collaboration, but member institutions still seem unready to share despite overlapping functions. The need to identify and cultivate local champions, particularly within various arms of government and amongst member institutions. These can help push for the NREN cause and be advocates in places like the regulators, the Ministry of ICT (or telecommunications), the Ministry of Education, etc. 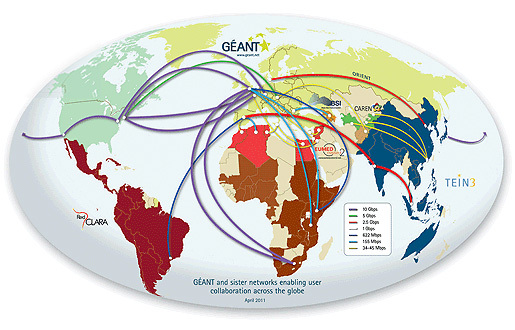 Many NRENs start life as bandwidth consortia, given the high cost of bandwidth in Africa. It is quite easy for commercial ISPs to offer such services at better prices in a bid to thwart an NREN and fend off perceived competition. How can nascent NRENs engage them can help address this threat? How can NRENs nurture the human networks that provide a structure to enable Africans to produce and share knowledge more effectively? To increase research and academic collaboration? Such networks would form the core users of the underlying physical networks that NRENs seek to create. How can NRENs foster local content networks so that NREN network traffic is increasingly local or regional and not always destined to the west? How can NRENs help develop and support ICT capacity within member institutions in competition with the private sector that can pay much more for ICT talent than NRENs will ever afford? This must all happen within the context of increasing student enrolment and dwindling support and investments in education from African governments. Higher education in Africa is becoming commercialised—as government owned institutions receive less funding and increasingly compete with commercial institutions or those funded from other sources. Policy makers in Africa should wake up to the potential role that NRENs can play within their national development plans. If developed countries, with much better digital infrastructure still continue to invest in their NRENs, how about us who are just barely getting started? They need to formulate policies and regulations that empower the national NREN to exist and thrive. Government should bestow formal recognition to the NRENs and facilitate them to acquire an appropriate legal status. In some countries, the legal recognition that NRENs can acquire might be in conflict with the international expectations and thus hinder the local NREN’s full participation in the global arena. Regulators need to grant NRENs appropriate licenses that permit them it to peer or transit network traffic with neighbouring NRENs. This is a prerequisite to full participation within the global NREN fraternity. Leaders of research and academic institutions need to figure out ways to better collaborate even if they compete for the same research grants and students. They face similar challenges when it comes to ICT integration within their core functions. How can they effectively work together to create more awareness about the potential role of ICT in education? Address the fear-of-change and mind-set issues that arise when people feel that their once-lifetime jobs are now threatened? Tackle the varying levels of ICT literacy both within their own and across institutions? Regional RENs need to engage regulators through regional fora and enlighten them about the potential of NRENs within a national context. In addition, they need to encourage African NRENs to peer locally on the continent. For while there might not be much to share for the moment, “one generation plants the seeds, another generation gets the shade” says an African proverb. The recently approved AfricaConnect project is a good start in this direction, but it is just that, a start! This discussion is part of the eTranform Africa initiative. « How Can Research and Education Networks Increase African Educational Development? Written by A. Ndiwalana on June 22, 2011 in National Research and Education Networks.